No cooling vent in the glove box compartment for the facelifted EcoSport. The storage box under front passenger seat and lumber support for driver seat has been removed too. 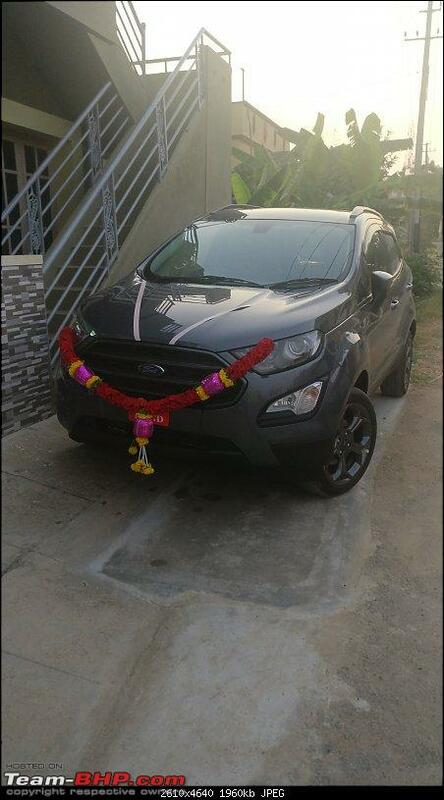 The wheel arches for EcoSport is available as an official accessory. It definitely improves side profile looks by leaps. It helped to protect my car paint when one mad man tried to brush his scooter on the side profile of my ride. One request, please provide your inputs for placement of Team-BHP stickers. I am unable to decide placement on the tailgate. 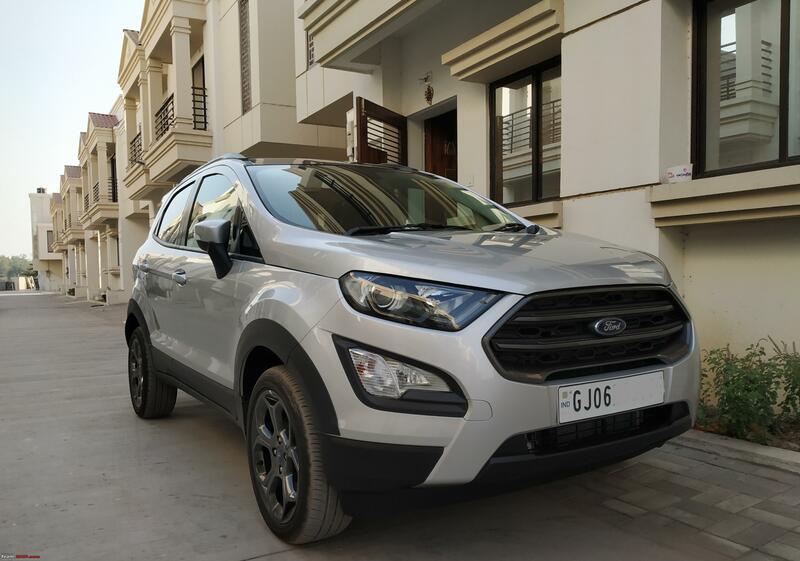 I observed that Ford India has updated their list of official accessories for the EcoSport. Last edited by RedStallion : 21st January 2019 at 22:45. Looks sweet!! 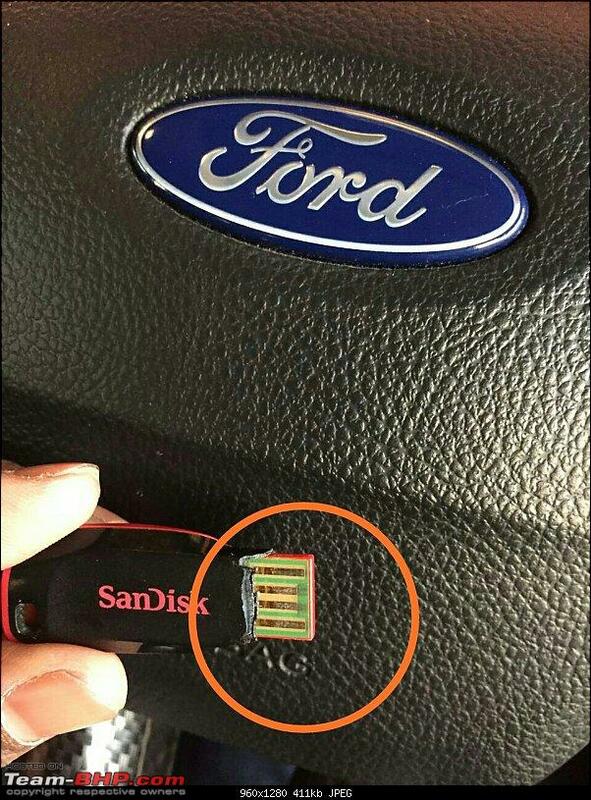 I am planning to get them for my car too. I've seen it in person and it looks perfectly integrated with the existing cladding. It appears as good as straight out of factory, doesn't feel like it's an accessory at all. Last edited by suku_patel_22 : 22nd January 2019 at 02:05. Thanks a lot dude. Here's a pic of the booster now that i have it, guess its the first smoker being posted on here. I was also wondering about getting one of these ceramic or opti-coat things to keep the car scratch free for a while, but damn they have a hefty price tag, are they worth the 30+ K premium they demand and how long do these coats last, any insight? Thanks in advance. 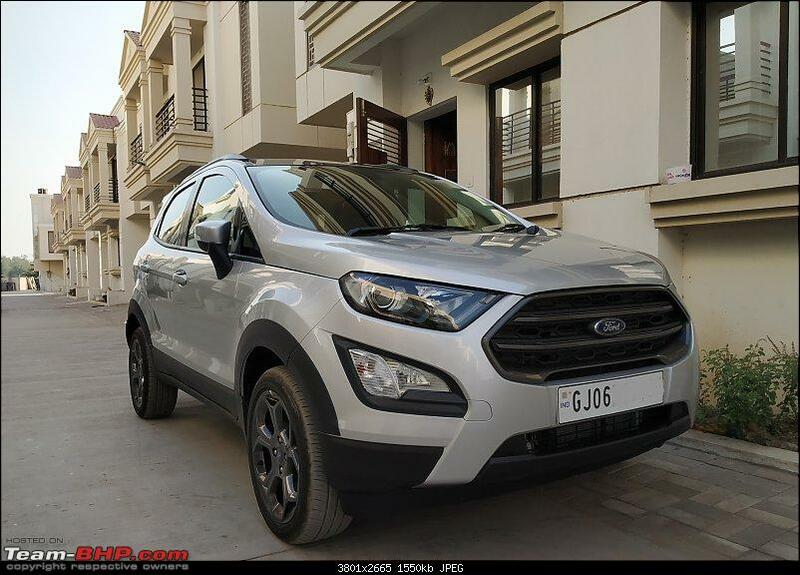 I am planning to buy an EcoSport but I'm a bit skeptical about the ecoboost engine. I really likes the looks and features of the 'S' variant but doesn't need a diesel, hence the dilemma. Should i go for the 1.5L titanium plus or the feature rich 'S' variant? I have a few questions that the ecoboost owners could answer. How is the lag? Especially when loaded. With 4-5 people + some luggage, will the engine show its lack of displacement? I will be driving around in mixed conditions(city+highways). Have you at any point till now in your ownership period felt that you could have gone for the larger engine? If so why and when? How is the maintenance rate compared to the 1.5L engine? I am currently driving a 1L 3cyl maruti WagonR. Although the engines can't be compared per se, my family especially my father is not convinced in buying another 1L engine for 13+ lakhs. He has in his mind the shortcomings of the Maruti engine. It really struggles with load on steep inclines. With AC its just dead! So I kindly request all my fellow bhpians who own an ecoboost EcoSport to give in their valuable inputs on the above mentioned points. Last edited by blueeyed : 30th January 2019 at 17:01. 1. Super engine if you love to drive hard. Really FTD. Bought it after test driving the Punto Abarth. 3. Decent package in terms of space, utility. 2. FE is abysmal if the car is driven hard. This happens with most small capacity turbo engines. But cruising between 60-90 km/h will give you decent FE. I get around 9kmpl in Mumbai city b2b traffic or when driven hard. and 16 kmpl highway @ an average speed of 50 km/h which I have achived on certain sections of the Mumbai Goa NH17 route with some climbing. 3. Tight on space if you carry sizers often. My advice is if the dealer is good, take a proper test drive with the persons likely to travel with you. Go in for an extended warranty. I was also wondering about getting one of these ceramic or opti-coat things to keep the car scratch free for a while, but damn they have a hefty price tag, are they worth the 30+ K premium they demand and how long do these coats last, any insight? Thanks in advance. Your ride looks great in the smoked grey! For ceramic coating, I had gone through discussions in the Team-BHP forum itself. I found many BHPians vouch for it. They provide 2-5 years warranty depending on the vendor based on a number of coatings and maintenance schedule. However, I believe that ceramic paint protection is too pricey. Is it really worth it? Do you still want to go with it? I guess that depends on the deal, you get from a bargain. I would like to adhere with the user manual advice. It advises to get the waxing done once or twice a year. IMO, the engine should be punchy. The drivability of engine has been improved with the new 6-speed manual gearbox but there should be some lag. (Not significant as with the older 5-speed manual gearbox) I have not come across people complaining regarding its power and torque. Thanks a lot dude. Here's a pic of the booster now that i have it, guess its the first smoker being posted on here. Congratulations! The grey shade looks beautiful in the S trim. Do the interiors have orange inserts or you have an option to choose all-black? Thanks dude, I wanted the black personally but many have said this looks better in person. It does have orange inserts which i'm not a fan of, looks really odd in a grey car. Also I had few issues with fit and finish with the car which i need to get sorted, especially the plastic walls near the gear liver, below the orange surround, keep an eye on these things, they are generally rather badly fitted and rattle when touched. Thanks for the replies guys. Still waiting for the other owners to comment. Quite a valuable feedback. Thank you very much. I agree with you on all the above points. I really liked its build and dynamics. My only gripe with Ecosport is the lack of rear space. The legroom is limited and the black interiors aren't doing any justice to it either, feels cramped. But for me this can be overlooked. The thing that really concerns me is the Ecoboosts' drivability. Your words on the engine is confidence boosting. The comparison you made just adds to that. If i may ask, how many kilometers have you covered? How does the engine feel when loaded? This is the point that I am actually concerned with. Need to know how well have the new transmission helped the engine in its drivability. Facelift owners, please comment on it. The ford dealer I went to(the only one near me) had only display vehicles of the Ecoboost variant. According to them, they have only one ecoboost testdrive car for the whole of Kerala and they do not take it for long distance for customer TD's. So I would have to make time and go all the way to their main branch for a testdrive. So I thought I would gather some real life experience from other owners before I plan for a 'testdrive journey'. Thanks for the reply RedStallion. I haven't considered the diesel engine till now. I am more of a 'petrolhead' and also my yearly running(around 5K) doesn't warrant a diesel car. But with the above said feature-list of 'S' variants and the small price difference between the engines, I could consider the Tdci, but only after getting a proper TD of the ecoboost. Hope other ecoboost owners would also help me by giving in their valuable feedbacks. I own a 2016 Trend Plus Ecoboost and if I were in your place considering a new vehicle, I'd put my money on the 1.5 Dragon or 1.5 Diesel. Sure, Ecoboost is one heck of an engine but after using a mix of naturally aspirated and turbocharged engines, I'd happily return back to naturally aspirated ones because of their straight forward functioning. Last edited by k.sumit : 3rd February 2019 at 21:49. 2. I normally do not load/overload the car for the first 2.5k kms but occasionally it does happen and I noticed that the engine would strain when the car was loaded. I adapted my driving style by keeping the revs higher and staying in 1st longer. Post 4k kms, I noticed that even this was not needed and the car would manage the load well. The key is to drive it in a style that suits the engine characteristics. 3. I would also like to add that I test drove the Punto Abarth, Linea TJet, Honda City, Maruti Ciaz, Brezza & S Cross, and the earlier 1.5 petrol ES before settling for the ecoboost which I test drove in Goa as no dealer in Mumbai had a test drive ecoboost at the time. I can tell you that though the rear seat is tight for 3 L sized adults, the leg room is decent. I am 5 10 and I sat in an ES diesel driven by a 6 8 gentleman in front of me and though it was tight, it was not uncomfortable. The half hour journey experience trumped a similar drive in an S Cross with a much shorter driver. My mother in law who is 90 and pretty short and uses a walker has no problems entering and getting down from the back seat of the car. She prefers this car in comparison to the Baleno CVT which I own and which has loads more space behind. As k.sumit says, if you are a petrolhead, take a comprehensive drive of the dragon. If you like it buy it but if you definitely need more excitement buy the S ecoboost. It will take a little getting used to but you'll enjoy the car. Use Shell V Power petrol for best results. 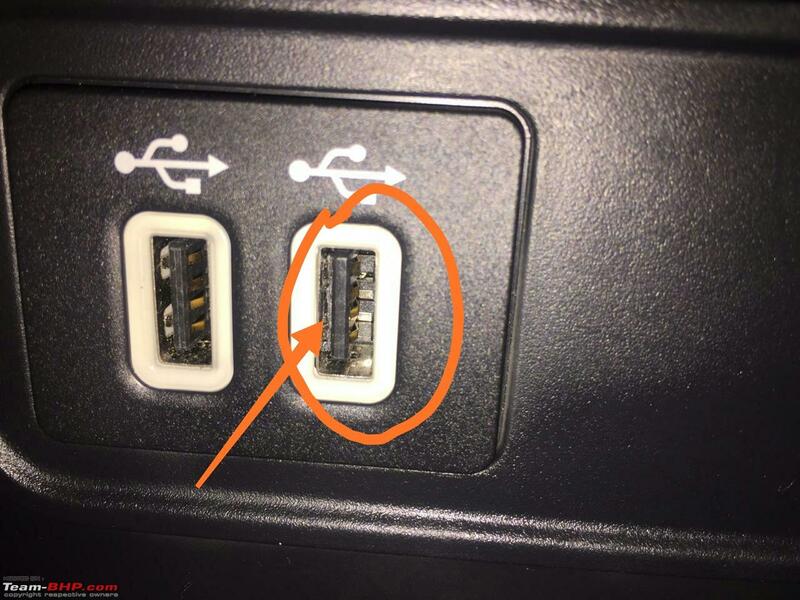 Need your kind help regarding a issue in my Car. While pulling out the pen drive that I use for listening music, a part of it broke and stayed inside the USB port. I am not able to take it out. 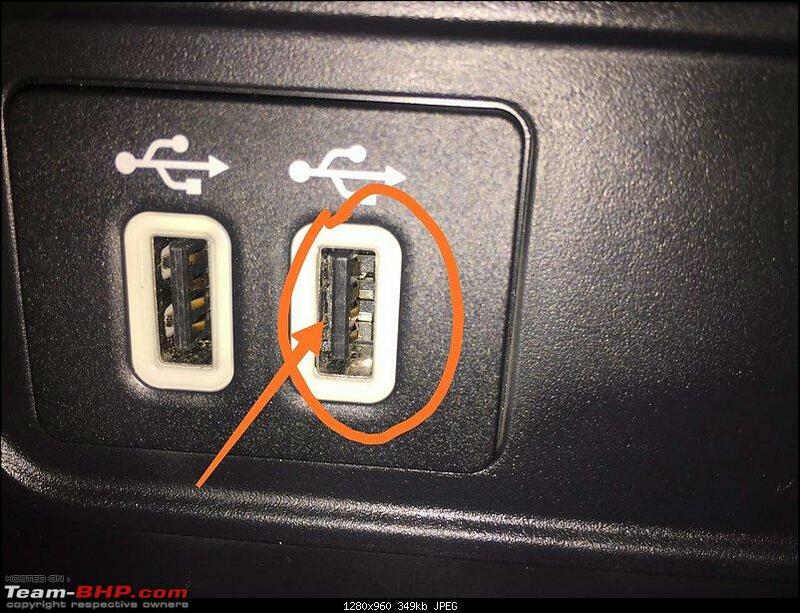 Here you can see the part that is lodged inside the port. 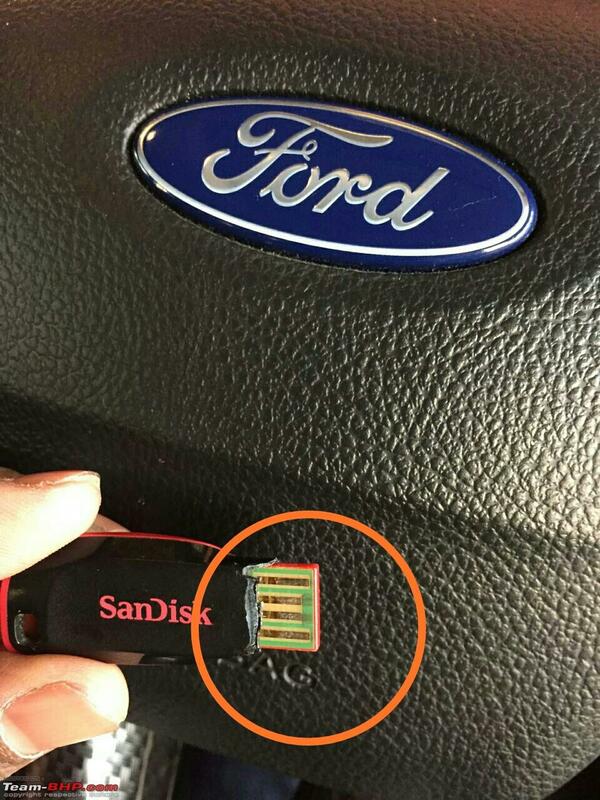 Here is the broken SanDisk stick. Can easily be removed with a small knife or flat head screw driver. Or even the sim card ejector tool. Just pry it out carefully. Folks, just wondering, the XUV300's tyres have slightly thicker sidewall right, will those fit on the S and would they make any difference w.r.t tyre durability and ride quality? Right now I find the S to be a tad bit stiff, especially with me having a rod and screws in my arm. Thanks.